The morning started as usual but I was having a little difficulty in waking DinoBoy up, my usual 1-2-3 does not work and I have to raise my voice to get him out of the bed. After he has washed up, he started to walk towards my bed, wanting to laze on it for a few minutes as usual while I put on my make up. "Go to your room and wait for me" I snapped. "MOM! You don't have to shout at me, you know." "Well, if you have known better you should have head off to your room instead of going towards my bed!" I snapped again. "You could have tell me nicely." He mumbled while leaving the room. Well, at least we managed to leave the house at 7am and we had a near perfect breakfast at our usual place with eggs + toast and a cup of ice milo (would have been perfect if DinoBoy did not dripped eggs on his white school uniform). And we did part at the school gate with positive emotions with no bad feelings about each other, we hugged & kissed, I wished him a good & fun day + you better be good today instruction(s). I have to admit that my emotions are not really that great with the things going on in the house. My 3 days old throbbing headache, neck ache and lower back ache is not making me feeling any better or nicer. My heat rub cream is not helping much, perhaps I should rub on more often or I should run back to my chiropractor to have him adjust my back to see if I will get better. Sitting here in the office thinking back about this morning, I felt guilty. I was unable to contain my feeling and I lashed it out at DinoBoy, it was not unfair to him. I could blame it on the throbbing headache that prevents me from thinking clearly but I know the problem lies with me. Sadly, what's done cannot be undone I just hope that Tomorrow will be Better. It happens with all of us what you went in the day & its all right. But yes the little ones do not understand & they should be kept safe from our mood swings. Tomorrow will definitely be better, just go home & hug the DinoBoy. That's my mantra these days too. 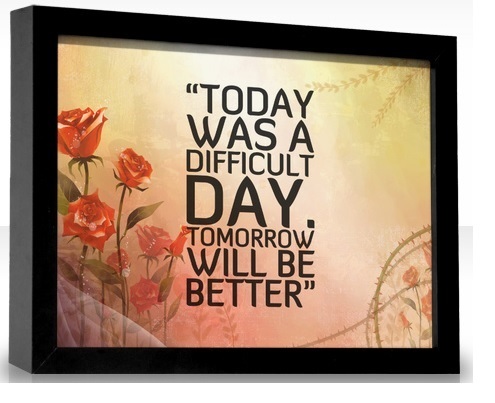 tmw will b better! It better be! hahah~ otherwise it will be so depressing.